162 mm holes: no need of professional drilling machines, easier to find drilling tools, even less outdoor impact. foldable outdoor grills: during most of the year the unit is not working but, nonetheless, standard fixed grill let pollution (dust, flies and bees, noise) pass through. INNOVA has designed new foldable grills, activated by air inlet and outlet, that automatically open when the unit is working and close when the unit is off. Therefore, with “2.0”, you now have a better indoor comfort and even less maintenance. reduced depth: with only 165 mm, “2.0” is the thinnest in its category. The best design impact, not only outdoor but also indoor! optimised capacities: less consumption, less noise. More and more insulated buildings, double glazing, growing request of the correct indoor temperature (3-4°C less than outside, in summer time, and not polar cold! )… because of this “2.0” has now two capacities, Kw 1,65 and 2,30 , in heat pump: the right capacities, the right temperatures, less consumption, less noise. noise level: thanks to advanced research on insulating materials, INNOVA has drastically reduced the noise level of “2.0”: now it is really difficult to distinguish it from a standard wall split unit! consumption: the right capacities plus the use of DC fan motors make now energy consumption of “2.0” absolutely acceptable. easy to install: “2.0” can be easily installed low or high on the wall. The air sweep opening can be easily adjusted thanks to a simple pressure on the control board. All what is requested for installation (template, supporting bracket, outdoor grills… not the drilling machine, of course!) is contained in the carton box. remote and on board control. Functions can be selected both from the remote and the on board control. The onboard control has a”lock” function so to avoid any unproper use. “cooling” and “cooling plus heating” functions: “2.0” performs in “cooling plus heating” as a standard and, in heating functioning, a condensate drain is requested. 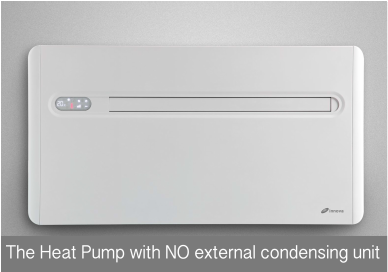 In case you decide that the product will perform in “cooling only” mode, you can desactivate the “heating function and the unit can be installed without condensing drain.